LOGANSPORT, IN.- A blisteringly, hot afternoon set up for another special night of micro sprint racing action as US 24 Speedway raced not just one, but two entire feature programs. The spectacular eight feature program began with the A-Main make ups for the Fred Marlowe Outlaw Nationals. Fred Marlowe was a great ambassador to not only micro sprint racing but racing in general. After a lengthy career in stock cars, Marlowe took up micro sprint racing in 2005. 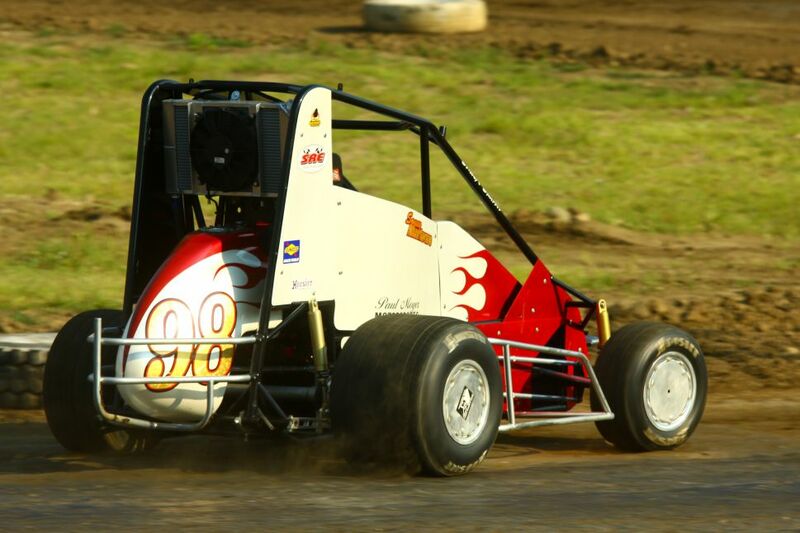 The passion for micro sprint racing never left, as it turned into a hobby well into his retirement. "I was very honored when US 24 Speedway decided to have a race in honor of Fred's memory. He was a very humble man, and would of been very honored as well," said Fred's wife Linda. In honor of his late father, Fred's son Sonny Marlowe piloted the famous red and white #98 (upper center) on Saturday night. "This race is very special for the entire Marlowe family. This is the best race our family has ever run. We never raced for money. We just wanted to make new friends and have fun," Sonny explained. "My Dad has always bought great equipment, so there is a little pressure to perform the way he would want me too. Our family is here to watch me race, but this night is dedicated to the memory of my father," Sonny explained. Kokomo, IN. native Nate Lauderbaugh (Pictured Left) won two features (Nonwing and Wing) during the Fred Marlowe Outlaw Nationals. After this remarkable feat Lauderbaugh said, "It was a very special night. I have been racing with the Marlowe family for a long time, and they are very good people. It really means a lot to get two feature wins, when racing in memory of a longtime friend like Fred. I'd like to thank Shively Racing Engines, Infinty Racing Shocks, Hoosier Racing Tires, Carroll County Tire, my Dad, and Pedge for their continued support." Monticello's Jimmy Wood scored a strong second place finish in the Nonwing portion. Shayne Riley, Garrett Abrams, and Parker Price-Miller rounded out the top five in the first Nonwing A-Main. Kokomo, IN. racer Carson Stout (Pictured Right) swept the Junior Class program, winning both Junior A-Mains on Saturday night. Summing up his memorable night Stout said, "Winning two features in one night is a first for me. It's definitely been a special night for sure." In both Junior features, Kayden Shaughesy and Dakota Williams finished second and third respectfully. Tipton, IN's Justin Weir (Pictured Left) put together a spectacular night, winning both Restrictor A-Main events. "It's been an unbelievable night. To win just one features is special, but to win two in one night from the pole is very special," Weir explained. "I'd like to thank my Mom and Dad, Steve Nedrow, Dave Parkhurst, TJ Racing Oils, Valken, and the Booster Club of Kokomo," Weir said about his special night. Austin Creamer, Tyler Orr, Jason Miller, and Dawson Stealy raced their way to top five finishes in the first Restrictor feature. Nick Wallace, Dawson Stealy, Ethan Pemberton, and Syndey Arnett finished out the top five in Saturday's second Restrictor A-Main. Datweiler won the second Wing Class A-Main. After the win, Datweiler said, "It felt great to overcome all the troubles we had tonight. We have been chasing the car all night, and it feels good to finally put it in victory lane." Wood raced his way to another second place showing in Saturday's Wing A-Main. Price-Miller, Peck, and Waterloo's Collin Erwin held on for top five finishes. Rushville, IN. 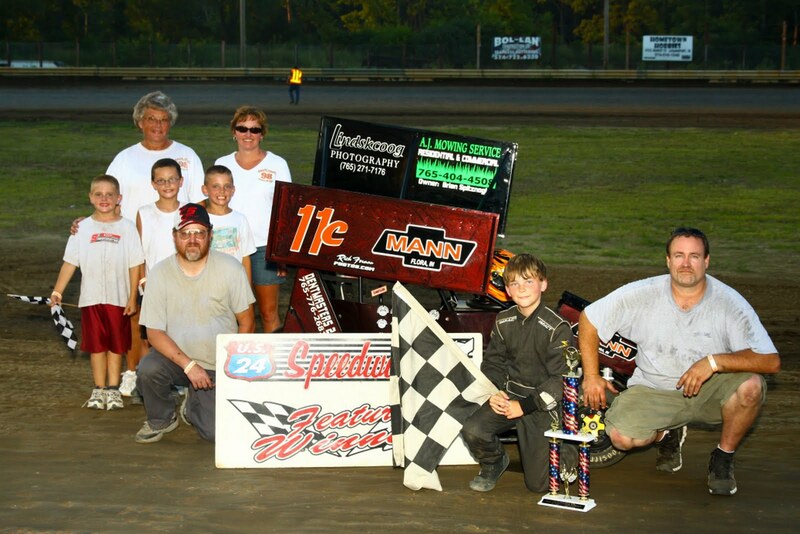 's Garrett Abrams won the eight and final feature in the Saturday's second Nonwing A-Main. ""This win wasn't easy, but it's good to get back ot victory lane. I'm happy that I was able to keep Datweiler behind me. It was a great way to end the night," Abrams said about the win. Datweiler ended his night right behind Abrams in second. Billy "The Kid" Cribbs raced his way to third, while fourth and fifth went to Ed Klinkhammer Jr. and Nate Lauderbaugh. I would like to thank the Wood family, US 24 Speedway track officials, drivers and personnel for letting me cover the action Saturday night. I look forward to covering more racing from US 24 Speedway each Saturday night. The micro sprint racing action continues at US 24 this Saturday, July 30th. For more information on US 24, please take some time to visit their official website (www.us24speedway.com). See you there!!!! Next to hit the dirt was the junior class. Tipton's No. 22 Justin Weir took the victory. 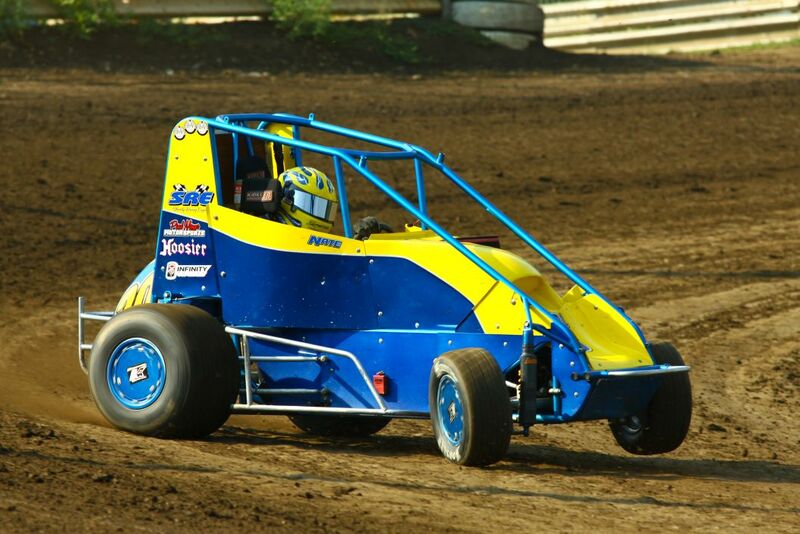 &quot;It felt good to get my first win at Peru (Miami County Speedway),&quot; Weir said. Kaleb Kinsler raced to a hard fought second place finish in his No.11 junior micro sprint. Taking third was No. 66 Jerod Glasford, who battled back from a Lap 4 flip. &nbsp;This was also in the paper for the Sun. May 24,2009 race . The junior class fired it up for their last feature of this special race weekend. The No. 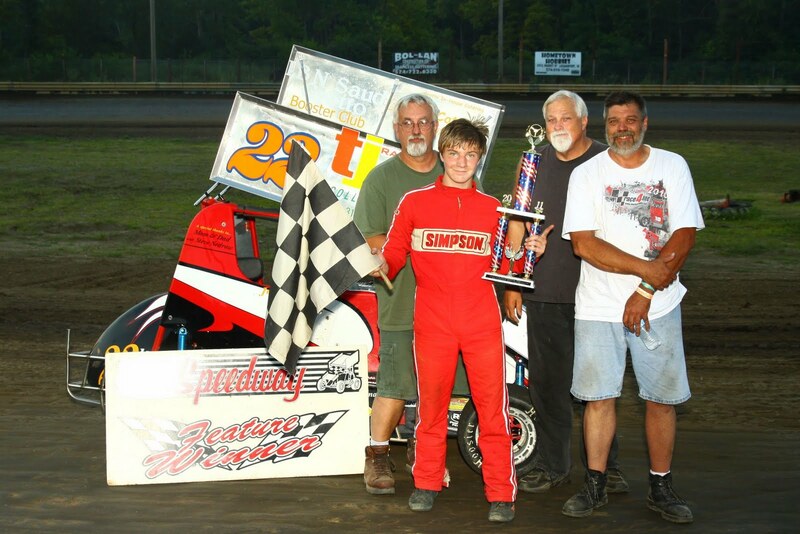 9p junior of MCS newcomer Parker Price-Miller took his first checkered flag on Sunday night. &quot;It feels great to win. I've only been in the car three weeks, and never drove a micro like this before, prior to now. It feels like hitting my first home run,&quot; Price-Miller said. Second place went to No. 22 Justin Weir, while No. 11 Kaleb Kinsler rounded out the top three finishers in the junior class finale. Rest. class was a close racing with alot of passing again this night 22w Justin Weir turned in the fastest lap time in the main showing a 12.404, 39 Rusty Disinger lead all 30 laps followed by 66j Jason Miller,55 Gavin Taylor,40 Dawson Stealy, 22w Justin Weir.